We recently became aware of a few issues with Entrez and BLAST. The most common issue is that in Entrez there are only two databases that you can search. The main cause is due to some changes the NCBI made to their service, that went live on the 1st of December, 2018. During the implementation there was a time when the available database list got corrupted, hence the most visible symptom. However, there are other issues that are less noticeable. We’ve just released MacVector 16.0.10 to fix these problems. Our upcoming release, MacVector 17, already fully implements the changes. MacVector 17 will be released within a few weeks, however, we wanted to ensure MacVector 16 users do not experience any issues until then. With the online updater you should have been notified by MacVector about the new release. At that point you will have the option to automatically update your copy. However, if this did not happen then just go to the MACVECTOR > CHECK FOR UPDATES menu to update. Alternatively download the full installer. Making restriction enzyme cloning easier with MacVector 17’s Restriction Enzyme Picker. 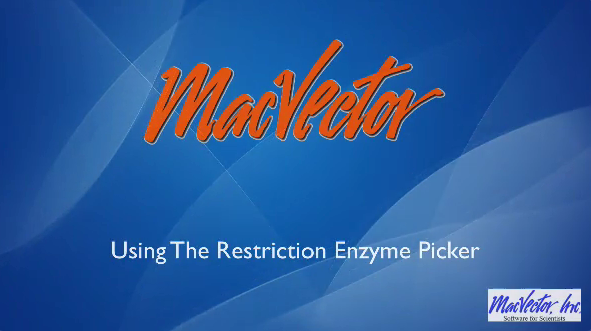 MacVector 17’s brand new Restriction Enzyme Picker is a new floating tool for selecting and filtering Restriction Enzymes to simplify the identification of useful enzyme cut sites. It initially presents you with a list of all available sites in a sequence. However, you can filter on many attributes, such as number of cuts, 5’ or 3’ overhangs and blunt ends. What’s more is that you can take a set of cut sites from one sequence as the input to digests of other sequences for easier planning of construct workflows. The Restriction Enzyme Picker gives you an interactive way to quickly show what enzymes are present in your sequence. The continuing advances in Next Generation Sequencing have made it relatively low cost to sequence prokaryotic genomes. Many scientists are embarking on large projects to sequence multiple related genomes. These might be clinical isolates of the same species exhibiting different pathogenetic properties, environmental isolates from different sites, or a study over time of the changes in microbial genomes from specific locations. Once you have your sequence, the definitive source of annotation is the NCBI Prokaryotic Annotation Pipeline. However, to have that run on your sequence, you must submit the sequence to the NCBI. This is not always ideal – perhaps you are still working on resolving repeat sequences for your genome, you don’t want to wait for it to be published or you don’t want to go through the hassle of a formal submission for many variant sequences. MacVector to the rescue! First, you need to download existing similar genome sequences – open the Database | Online Search for Keywords (Entrez) browser and search for [name of your organism] “+” “complete genome”. Assuming you are working with a reasonably common organism, you might find a few (or a lot of) hits. Select those you are interested in and click on the To Disk button, selecting a suitable target folder to save the downloaded genomes into. Now take your unannotated genome sequence and invoke Database | Auto-Annotate Sequence. 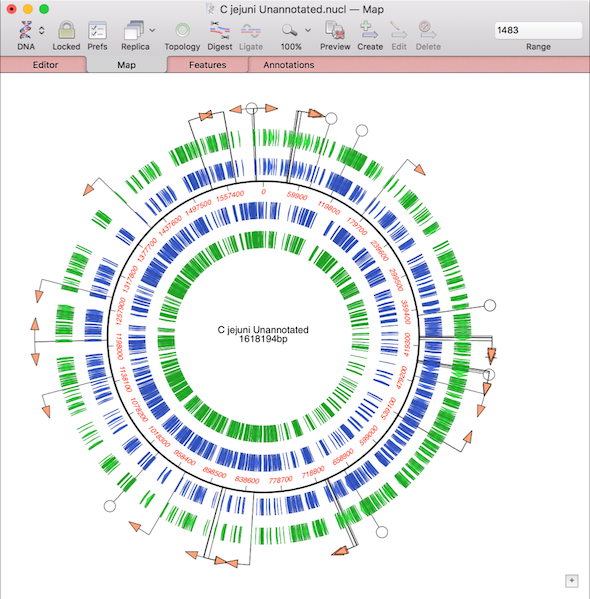 Select the folder containing your genomes as the target and press OK. On a 2.7 GHz laptop, scanning a 1.8 Mbp Campylobacter jejuni genome against 25 related C. jejuni genomes (average 5,000 features per genome) takes around 10 minutes with the default parameters, resulting in a fully annotated genome. There’s an upcoming “Genome Comparison” tool in MacVector 17 (due late summer) that lets you actually directly compare the features of two related genomes based on DNA or (for CDS features) protein sequences and reports all of the identities, similarities, differences and missing features. The tool confirmed that no features were missing compared to the NCBI annotated genome and there were just minor differences with a few CDS features where there were mutations creating or removing stop codons. As well as Scan for.. Missing Features that shows annotation on your sequences, you may have noticed extra CDS features annotated to your sequences. These are from the Scan for.. Open Reading Frames tool that automatically scans every DNA sequence window for open reading frames and displays the results in the Map tab. It’s very useful, especially if you frequently receive blank sequences from colleagues, or you want to show quickly show coding frames in unannotated trace files you receive from your sequencing service. However, if you are working with richly annotated sequences, you may find these distracting. It’s easy to turn off (and back on again). 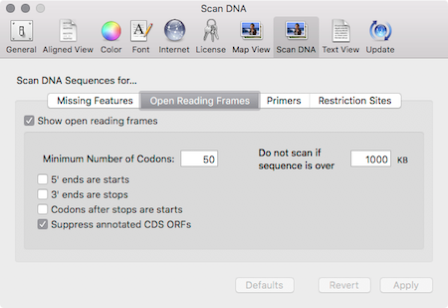 The tool is controlled in the MacVector | Preferences | Scan DNA pane, along with restriction enzyme sites and missing features. MacVector will remember this setting for all new sequences you open, until you turn it back on again. The appearance of the ORFs can be controlled using the Options | Default Symbols menu item. (Note: prior to MacVector 16 this tool was called Automatic ORF Annotation). Future releases of MacVector will see more automatic annotation and visualization tools. For example MacVector 17 will show primer binding sites from your Primer Library. So if there’s something you’d like to see please email MacVector Support. There are a number of MacVector analyses that generate tabular text output. Examples include the Protein Analysis Toolbox List output, the Raw Data tab of the ABI chromatogram document window, the Matrix tab of the multiple sequence alignment document windows and the Coverage tab of the Bowtie contig editor. 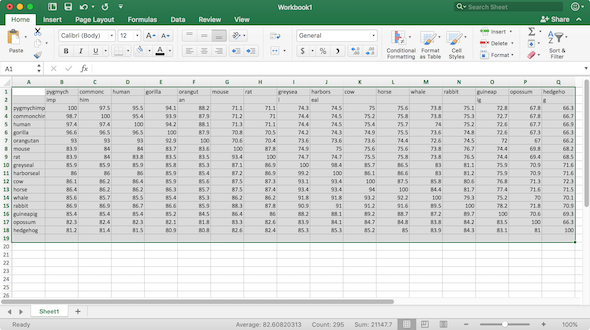 Each of these is actually composed of tab delimited columns, meaning that you can copy the entire table and paste the data into Microsoft Excel for additional analysis. However, over the years, the behavior of Microsoft Excel has changed when it comes to dealing with copied tab-delimited text data. For example, Microsoft Excel 2008 would directly accept this data – you could copy from MacVector, switch to Excel and choose Edit | Paste and each item would be pasted into an individual cell. However, the current version of Microsoft Excel 365 (version 15.41) behaves differently – if you Edit | Paste, all of the data on each line gets pasted into the first column. To get around this, simply choose Edit | Paste Special... There is just a single option for the data on the clipboard (“Text”), but when you click OK, the data gets pasted into individual cells just as you would want. Using MacVector’s Agarose Gel tool to design a digest to screen minipreps after a ligation. How to design a digest to screen minipreps after a ligation. Apple released macOS Mojave today (Tuesday 25th September). Over the past few months we have performed preliminary testing with MacVector 16.0.9 on various development releases of macOS Mojave through its development cycle and all appears to be well. So whereas we cannot state MacVector is compatible until it is officially released, we can say that we think all is OK.
Incidentally over the past few releases of MacVector we have made significant effort to future proof MacVector for upcoming releases of macOS. Please do note that MacVector 16.0.9 will not support Dark Mode. However, it is planned for the next release, MacVector 17 (out later this year). For older versions of MacVector you can check compatibility on our website. The results for macOS Mojave are not yet published, but it is likely that they will follow the ones for macOS High Sierra 10.13.4. Please note that we do generally recommend that you do not upgrade to a new macOS release until at least a few weeks after a release. Did you know that MacVector, Inc. offers FREE licenses for teaching purposes? If you are in the process of either preparing your lab for the upcoming year, or preparing for the courses you need to teach then don’t forgot that MacVector makes a great teaching tool. We offer free teaching licenses for anyone with an active, up-to-date license. All we need for your teaching license is the course name and number, start and stop date of the course, and the number of seats needed. We also have many great resource materials that will help you or your students learn MacVector. Due to the forecast storm the Tent Show has been postponed. As soon as we know the rescheduled date we’ll update. We’re at the NIH Research Festival this week. Please drop by our booth on Thursday or Friday, when the big, white exhibitors tent is open. We’re on Booth #520 on parking lot 10H. We enjoy the tent show and look forward to meeting NIH MacVector users both new and old, and anybody who is interested in learning to use the easiest to use sequence analysis application for the Mac. 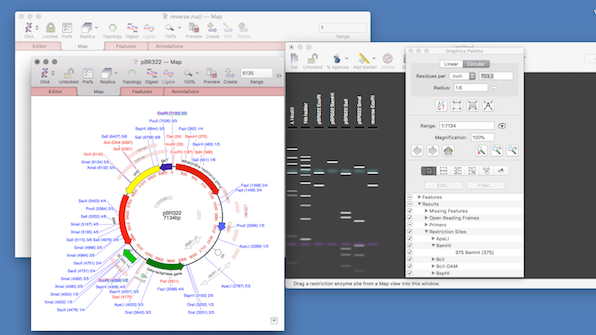 We’re happy to just have a chat, but we’ll also be able to give you a preview of our next release, MacVector 17.0, which will be out soon (automatic Gibson assembly, Compare Genomes, and much more!). We’ll have some goodies too – our popular mousepads with the IUPAC Genetic Code as well as some Pop sockets for your cell phone. Don’t forget that the NIH host a Picnic. There will be food from several restaurants being sold at a discount for both researchers and exhibitors. The next OS release for the Mac will arrive later this year. MacOS Mojave is a significant OS upgrade and includes a lot of new features, especially when compared with the differences between OS X El Capitan, macOS Sierra and macOS High Sierra. Our developers have been hard at work ensuring that when macOS Mojave is released, MacVector 16 and the following release (MacVector 17) will be fully compatible. As usual for older versions you can check compatibility on our website. The results for macOS Mojave are not yet published, but it is likely that they will follow the ones for macOS High Sierra 10.13.4. For recent older versions it is likely that they will work fine. Over the past few version we have been striving to future proof MacVector for new versions of macOS. However, for older versions of MacVector there will be issues. Apple do make significant changes between releases. One issue that you will see with MacVector 13.5 and earlier versions is regular dialogs stating that this version of MacVector will not work with the next release of macOS. A more subtle version of this dialog started appearing with the release of macOS High Sierra 10.13.4, when Apple added warnings to all 32 bit applications. Here at MacVector we always strive to stay ahead of the game. When Apple recommended (many years ago) that all applications should be 64 bit, we immediately started working to move MacVector to be fully 64 bit resulting in the release of MacVector 14 in 2015. Please do note that whereas our developers do develop and run MacVector on Apple’s public and developer betas of macOS, we really do not recommend that users run MacVector for any real workflows on beta releases. There may be unexpected issues that you may encounter.